manila fashion observer: Shu Uemura Tokyo Kamon Girls + Where To Buy! Shu Uemura Tokyo Kamon Girls + Where To Buy! I love love love Shu Uemura's cleansing oil, and I swear by the purple one - White Recovery EX+ Brightening Cleansing Oil (although honestly, castor oil + olive oil works just as well! Promise! But I have yet to get myself a bottle of castor oil here, which reminds me, I should ask my mom to bring me one from Mercury Drug when they come over...). This bottle is just part of a new set of Shu Uemura limited-edition cleansing oils (make-up junkies take note, there's a limited-edition brush set and train case to watch out for too!) done in collaboration with author and Japanese manga artist, Moyoco Anno (she writes books and draws Josei manga - the Japanese equivalent of what we know as "chick lit", hence she is very popular among young Japanese women). 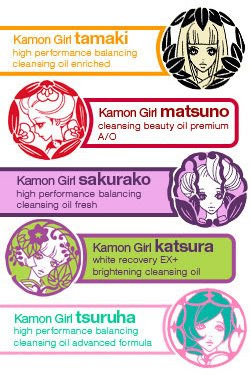 I'm not too sure when this is due for launch in Manila, but for those in Singapore, there's a Tokyo Kamon Girls party on June 26, 2009 from 6pm - 8pm at the Shu Uemura counter in Robinsons Raffles City! Expect a Tokyo Kamon Girls-inspired makeup demonstration by makeup artists, themed refreshments, double points for Shu fanatic members, and an exclusive door gift worth over $30 when you join the fun! Places are limited for the party, so you'd have to RSVP to Jean Tan at jtan@sg.loreal.com or 6233 0207 by June 25, 2009. What's the castor and olive oil thing? Please share! I am curious now. Thanks. I'm loyal to Shu Uemura make-up products (and the brushes are wonderfully crafted!) but skincare cleansing, I stick to De Cleor and Clarins. But it wouldn't be a bad idea to try this out, right? Haha. Anyway, your baby is too cute! Perfect timing too for father's day! If I were some knitting goddess, I would have knitted Berry some organic socks or blanket. (: Maybe sometime. what is castor oil for? I love the shu oils! My favorite is the A/I for sensitive skin. I'm not a manga fan, but I really like these bottles. Nothing removes makeup like it! Not a bad idea to try it Eunice! Heehee! I have yet to try De Cleor but I do use Clarins body lotion and I like it too! I should actually be more adventurous haha! Oh! And thanks! We are having such fun just watching Berry make faces, Berry cute! Haha! Castor oil is actually some kind of laxative (haha!) but it is also used for skin conditioning and as a food additive =) I'll definitely share my beauty regimen when I do my Oil Cleansing Method post! Yeah! I so love it when I see make-up melt away with the cleansing oil. The cute bottle is a definite plus too, heehee! Do you know if this collection will come to the US??? I love the packaging so I really hope so!